I really enjoyed this project because it helped me see the proportions of the body and showed how the body is structured. It was also really good practice for me with shading and depth. Drawing the skull really helped me see where the eyes are compared to the head with the other facial features. 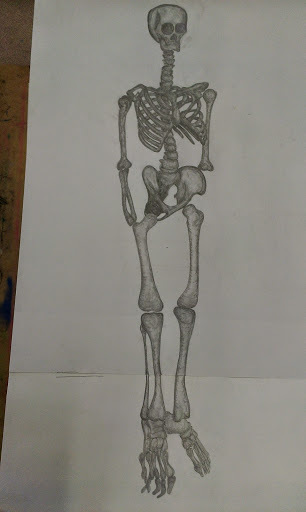 I did draw the skeleton too large so the ankles and feet did not fit on the full page. I resolved this by simply attaching an additional sheet and continuing so I could still have the full skeleton. When I first started, I had thought I had proportioned the skeleton out but I should have double checked my measurements because they were off and when I realized that I just continued and did not remeasure. Even though it still turned out relatively well proportion wise, I think I could have measure it out better.